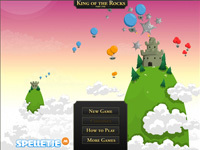 Enjoy this conquering game, in which you have to take over the castles and mills of your opponent. Send your army in balloons to the enemy castles, but also to the neutral castles and mills, for more castles means more balloons, and more balloons make a fast defeat – let is not be yours! Have fun!